Have you ever noticed how easy it is to let your Inner Critic beat you up, no matter how hard you try? Do you find that it’s easier not to bother with your dreams, because you feel scared that you’ll fail? Do you find yourself juggling life, feeling stressed and exhausted, whilst secretly knowing there must be more to life than all of that? Have you had enough of it yet? I want to share with you one of the techniques I peronsally use for unblocking blocks, releasing fear of taking a leap and getting past the inertia of sticking with the status quo. When did you last give yourself credit where credit’s due? It’s SOOOOO much easier to look back and beat yourself up than to spot the things you did well. We wouldn’t treat our kids that way, would we? So why on earth do we do it to ourselves? Actually, I’m not going to answer the ‘why’ question today. That’s like driving with your SatNav and ending up in the wrong place, then retracing your steps to figure out where you went wrong, rather than simply taking the new route to your chosen destination. Instead, I’m offering you a two-part technique that will help you to gently heal your past and take positive action for your future. Ready? YOU are amazing. YOU are unique. YOU are here for a reason, even if you don’t know it yet. But chances are, if you’re like the rest of us, you cringed at those first two statements. (If not, fantastic! Please share your secret via the comments 🙂 ). Why do we find it so hard to see our ‘good bits’, instead being obsessed by our flaws and, as Brigitte Jones calls them, ‘wobbly bits’? Because we rarely pause to stop and appreciate how amazing we are – even the teeniest bits of amazing. Instead we run a super-well-trained inner critic habit that shoots us down, whenever we’re feeling happy or successful. Take 3 deep, sighing breaths and let go of tension, coming back to this moment. Gently close your eyes. Now, I invite you to look back over the past few years or decades and allow your memory to find an example of something you did or a choice you made that was brave – or courageous – or changed the direction of your life. It often takes hindsight to spot these things, but they ARE there, if you allow yourself to see them. Start by looking back from where you are now and seeing that ‘younger you’ making that choice or taking that action. If there are strong emotions coming up (don’t worry – there don’t have to be!) then see them on a movie screen, instead. As you connect with that younger you, notice how they overcame indecision and confusion and possibly stress and fear, to make that choice. They showed courage and strength and determination. Wow. If it feels right for you, imagine giving that younger you a virtual hug – and whispering a ‘thank you’ in their ear. Now, taking a pen and paper (soooo much more mindful and effective than a computer keyboard or just doing it in your head), start to write a ‘thank you’ letter to that younger you. be specific – which choices and behaviours can you see, looking back, showed the courage and determination and made a difference to your future. Knowing what you know now, what do you wish you had known back then, that would have made those times easier? 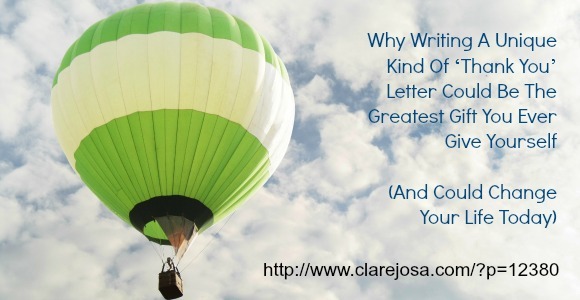 Write that advice in your letter! Let the younger you know how those choices have positively impacted your life, over the intervening years. Let genuine thanks, gratitude and love pour from your heart into the heart of the younger you – feel that connection. When you feel ready, seal the letter in an envelope and write your name (or whatever your name was back then) and an approximate date on it. You can keep the letter, but to really give your unconscious mind the message, it can be beautiful to burn it (safely and responsibly, or course!) and, as you see the flames licking the paper, hold an intention in your heart of the younger you receiving all of that love and encouragement and gratitude and acceptance and ok-ness and moral support, just when you needed it. To help you to ‘get’ this technique at a deep level, I’d like to share with you a personal example of something I have thanked the ‘younger me’ for. Back when I was 30, I felt passionately about indulging my curiousity for ‘how people tick’. I had been studying NLP (the ‘user manual for your brain’) and was keen to become a certified Trainer – but I knew it would take time, money and – above all – some radical changes in my life. Being able to teach at that deeper level requires not only a completely different level of skill and understanding, but also a huge amount ‘self-work’, to get myself and my ‘baggage’. And I knew that becoming an NLP Trainer would require me to do all of this – and to shatter most of my beloved comfort zones. My calling to do the course was, fortunately, stronger than my fears so I quit my job as Head of Market Research for an international brand (I couldn’t get the month off work that the course required) and dived into the abyss of my future. And I hung around in that abyss for a good few months, until I was ready to exit my self-imposed crysalis and move into the next phase of my life. But the reward I got was the 11 years since then of being able to work with people at a deeply-intuitive level, helping them to spot exactly where the next steps of their dream needed to be and inspiring them to heal and release precisely the blocks that had been keeping them stuck. And I get to do this every single time I write an article, create a video or design a course or Inner Circle programme – or work one-to-one. So that 3 months of courage pays off every single day. And I thank the ‘me’ back then for being brave and taking action. Please pause and do your ‘thank you’ letter now! Now you know that the current ‘you’ can send so much love, support and gratitude to the ‘you’ in your past, it’s time to do a 180. It’s time to allow this technique to help you to create the future your soul has been dreaming of. Is there anything you’re secretly dreaming you could do or be, right now? Are there choices you know you need to make, that could impact your life? Are you sensing your heart getting ready for your next big leap, but you’re feeling too scared to jump? Then why not enlist the help of the ‘future you’ – just like you helped the ‘younger you’ a few moments ago? Again, taking 3 deep sighing breaths, gently close your eyes and return to this moment. Imagine you can connect with the ‘future you’ – in 10 / 20 / 50 years’ time – whatever feels comfortably weird for you! Now, standing in their shoes, what would they LOVE you to do today, to allow them to become who your soul dreams of becoming? 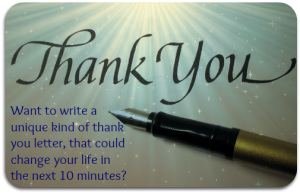 Is there a choice or course or book or other action that you could commit to, today, that would inspire the future you to look back and write you a ‘thank you’ letter? Knowing what they know about you and the intervening years, what support, advice and gratitude might that future you share with you today? If they were to write you a ‘thank you’ letter, what might it say? Now bring all of that wisdom and life experience and love and gratitude from the ‘future you’ and allow it to gently wash through every cell of your Being, right now, from the soles of your feet to the crown of your head. Feel the shifts, as old blocks melt away and you feel stronger and more courageous. Now, tell me via the comments which actions you are going to take today, to move towards becoming that ‘future you’. Woo hoo! How does that feel? Did you notice how fear and worry can move to become excitement and anticipation? And it’s time to take action! Before you finish reading this article, TAKE ACTION NOW! I’m curious: what support might you need? How can you hold yourself accountable? Which will be your first baby step? I would LOVE to hear from you – I’m so excited to see where this journey takes you. And THANK YOU for honouring yourself by going through this exercise. It is my gift to you, with love. Are you ready to dive in and TRULY make the changes you have been dreaming of? Today’s exercise is adapted from some of the amazing strategies and insider secrets that I’ll be sharing with members of my inspirational and fun group mentoring programme Transform Your Life With Gratitude, over the next 3 months. Of course, I know there are loads of free articles and videos here on my website, to help you change your life, but there’s only so far we can go, while we’re dabbling around at the surface. There comes a point when you realise that it’s time to take action and make deep-acting, life-long changes. And the changes you make today will have an amazing impact on every single day, for the rest of your life. The Transform Your Life With Gratitude Inner Circle is a unique way to get past the “sticky plaster strategies” we use to cope with life. It makes it easy for you to finally deal with the root causes of the stuff that has been making you feel stressed, exhausted, worried and putting up with life being ‘ok’, when your soul is dreaming of ‘fabulous’! Only you can decide if it’s the next step your heart is calling you to take – to discover how 10 minutes a day will change your life. Just in case it is, here’s where you can join in today: Transform Your Life With Gratitude. And you need to know that the Early Bird rate expires at midnight on Sunday 18th May (UK time) – so if you have been considering being part of this amazing programme, you need to dive in now. Lovely idea. I’ve heard of the thank you letter before, but the future self one is new for me. Like it a lot! Thanks! This is a lovely post Clare, and thanks for sharing your own experiences, it really brings it to life. I definitely don’t acknowledge the good things I’ve done enough. Thanks for sharing. Quite curious to see how I feel at the end! What a beautiful idea, am going to try this one out. I think so many of us never give ourselves the credit we deserve…we are our own harshest critics so often! I started some coaching recently and one of the things that came up is that I rarely acknowledge my achievements and instead choose to only concentrate on what I perceive are my shortcomings. I love the idea of these two thank-you letters. There’s a lot I can thank my old me for, so I image that my future me has a lot to thank the current me too. Just reading about this has created quite a shift. Thank you for sharing this. Thank you so much for sharing this – such a beautiful idea and I will definitely need to try it. It could be quite scary to go a bit deeper into your sole, but life changing too.